Good friends deserve a reward. At best one that they not only find tasty but that also benefits them. 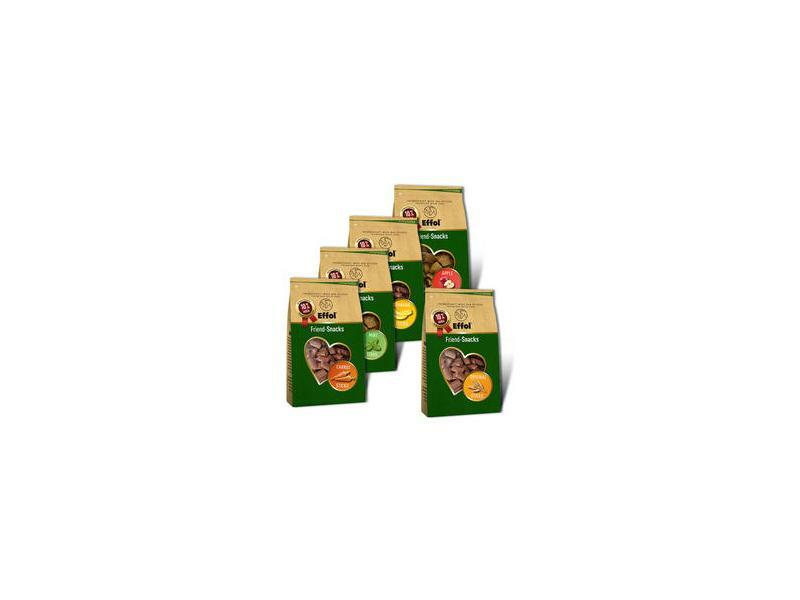 Effol Friend-Snacks are produced from healthy grain with a lot of fibre, vitamins and minerals. A hint of sugar-cane molasses makes them really tasty and various natural flavours ensure variety. Effol Friend Snacks are the nicest way to reward your four-legged friend. * Variations in the proportion of pre-mixtures in the formula account for the difference to 100 %. Liability only applies when goods are stored hygienically in a cool, dry place away from sunlight! 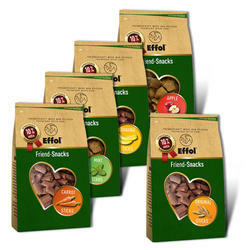 3-6 Effol Friend-Snacks Original Sticks per horse and day as a treat during training and for in between. 3-6 Effol Friend-Snacks Banana Sticks per horse and day as a treat during training and for in between. 3-6 Effol Friend-Snacks Carrot Sticks per horse and day as a treat during training and for in between. 3-6 Effol Friend-Snacks Mint Stars per horse and day as a treat during training and for in between. 3-6 Effol Friend-Snacks Apple Stars per horse and day as a treat during training and for in between. There are currently no questions for Effol Friends Snacks - be the first to ask one!